If you want to ride fast along wet trails you’ll need a front mudguard to keep your vision clear. Here are six of the best. 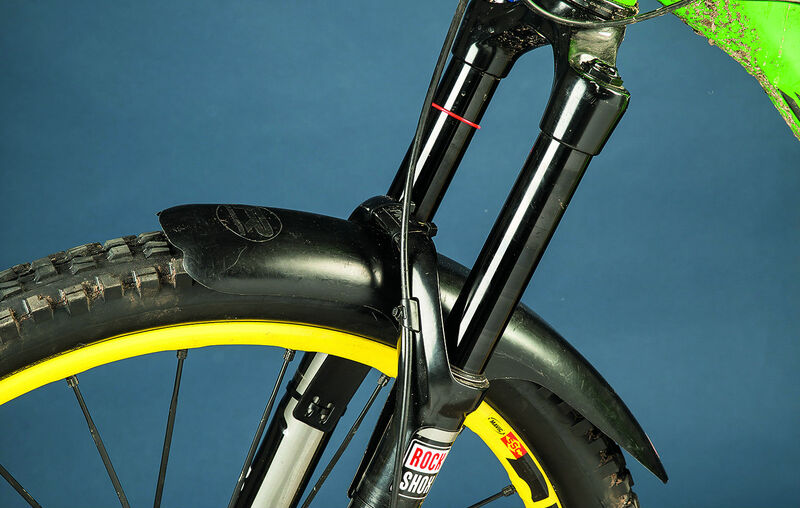 Mudhugger’s new FR (Front Race) mudguard is slightly longer in the front than the standard Mudhugger model, so has greater protection at higher speeds. This is because the faster you go, the further mud gets thrown forward off the wheel, and you then ride into the spray. It fastens to the lower fork legs and brace with zip-ties, and is compatible with both 27.5in and 29in wheels, although we found there’s not a lot of clearance when running fatter winter tyres upwards of 2.25in. 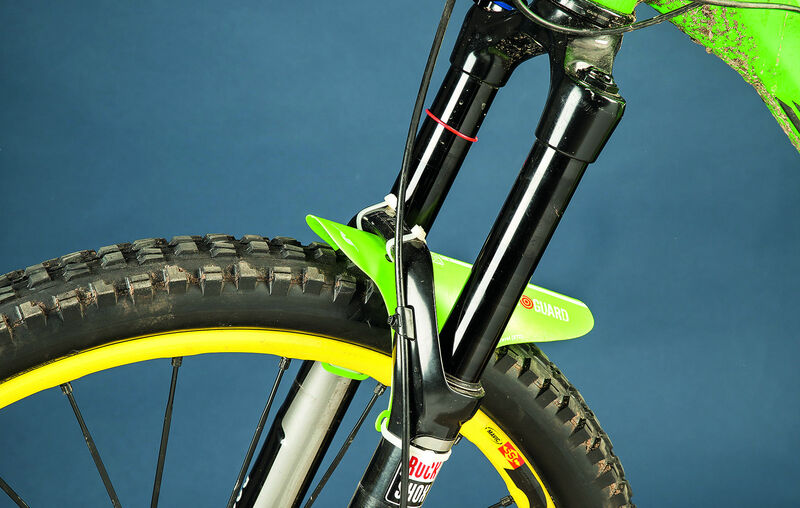 There are three slot positions, allowing you to rotate it forward on longer-travel forks. These slots will also accommodate thin Velcro straps if you want to remove the guard after a ride to prevent it bending in the boot of your car. The Mudhugger is slightly shorter than the Dfender, but it’s lighter, half the price and for the majority of wet rides, just as effective. 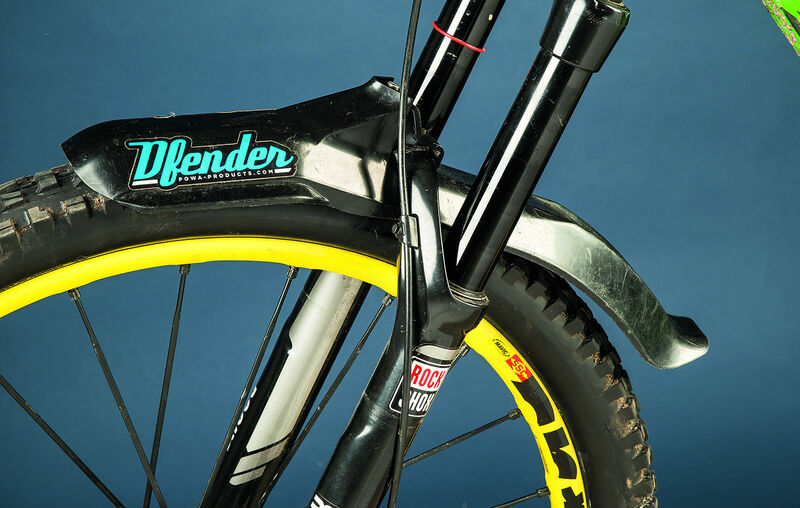 The Dfender is the only mudguard that you can remove quickly from the fork, which stops it getting bent out of shape during transit. 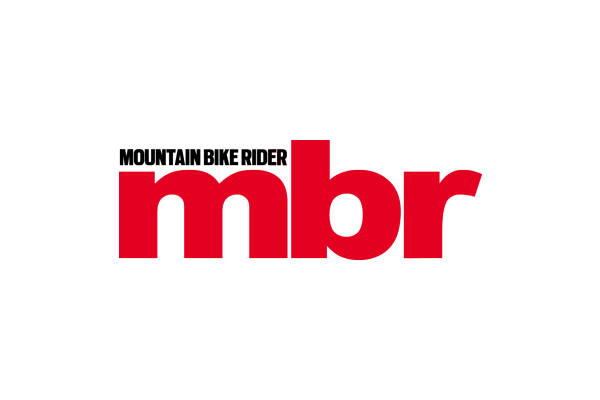 It has a machined clamp with vibration-reducing rubber bumpers and is held in place by a tiny thumb wheel. This replaces the old 4mm bolt, but there’s still an 8mm nut in the bottom of the fender that can easily fall out. For this reason, we’d recommend taping or gluing it in place. 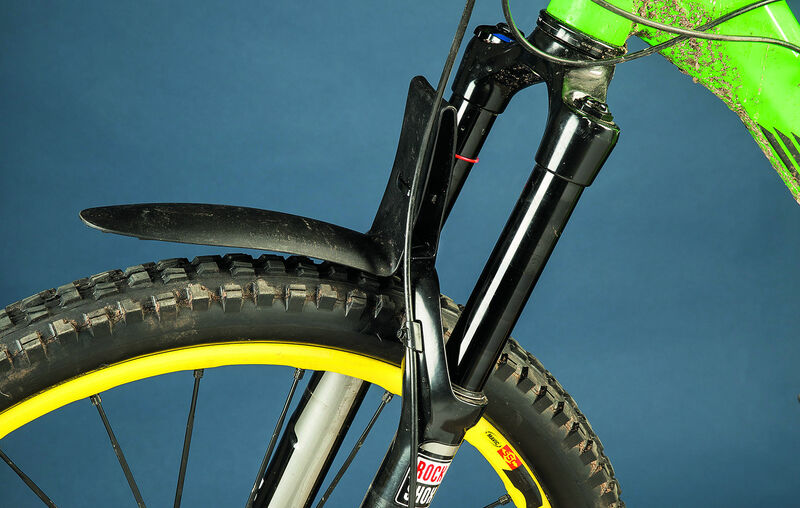 Currently the Dfender only fits Fox and RockShox forks, although we found it can work with other brands, it just depends on the shape of the fork brace. Spare clamps are available, but at £20 a pop it can get expensive if you’ve got more than one model of fork in your fleet. Like the Mudhugger, the guard covers quite a large segment of the front tyre, providing excellent protection at all speeds. It’s also well built, although that quality comes at a hefty price. Rapid Racer Products’ EnduroGuard is just one of many flexible polypropylene guards on the market. It bends to fit closely against the lower legs and brace and gets secured in place by zip-ties. The difference between the EnduroGuard and most other versions is it’s available in two sizes, for 80-120mm and 130-200mm travel forks respectively. 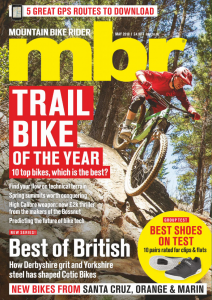 It also features Seal Guard Technology, which is basically a little extra tab of plastic that prevents mud and water from dousing your fork seals. The guard can also double as a shock protector, using the extra set of mounting holes. The reason these plastic plates are so popular is they’re cheap, light and effective. The EnduroGuard is shorter than all the others on test, but it still deals with medium-speed mud splatter. The best thing about this type of guard is its flexibility — you can bend it to release any built-up mud, and you can also stash your bike in the car without permanently bending the guard out of shape. Developed in conjunction with the Zefal-sponsored Polygon Hutchinson UR enduro race team, the Deflector FM20 is a rigid resin fender with a three-point fixing. Velcro straps and zip-ties are included for attachment — the Velcro is useful if you want to remove the guard regularly, the latter offers a more permanent fixing. Soft Rilsan covers stop the sharp edges of the zip-ties scuffing the paint on your fork legs, and a nice sticker kit is included to make the guard look pretty. 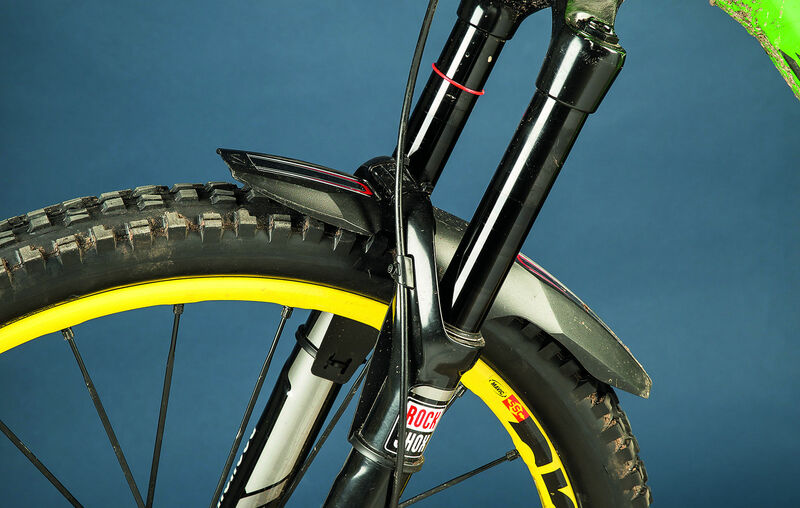 The Deflector FM20 is compatible with all three wheels sizes and most forks. It has an extended front section, but we found it sits pretty low to the tyre on a 29er wheel, although the front section is quite flexible, so we never had any issues with clogging or it catching on the rotating tyre. Overall the Deflector FM20 is affordable, lightweight and offers good all-round coverage. The great thing about plastic mudguards that fit underneath the fork arch is they work with any fork no matter the make or travel, any wheel size. They’re also cheap and lightweight. The FlapGuard from SKS is a little longer than most and has a slight amount of shaping, but it installs in the same way using four zip ties. The holes are quite far apart at the top, so it’s not as tight around the fork brace as some. With this type of mudguard the big issue is its fixed in place permanently, which means if you transport your bike in the back of a vehicle, it’s going to deform if you lay your bike flat. It’s easy to bend the plastic back into shape but eventually is will become distorted, as has happened here. At slow speeds the FlapGuard provides okay splatter protection but it could do with being a couple of inches longer at the front to catch those big globs of mud that get flung off the crown of the tyre at high speeds. Mudguards are rarely pretty, and of the ones we’ve seen, SplashBored is a whole new level of ugliness. But to be fair, it does get the job done. The company has combined two guards in one design — a front-facing guard and a shield type that sits between the fork crown and brace. The latter stops low-speed splatter thrown between the upper tubes and the front portion collects any muck that’s flung forward at higher speeds. We like the fact that the SplashBored doesn’t bend if you lay the fork flat in the back of the car, but it does wobble like a nodding dog as you’re riding along — granted, this is more annoying than anything. The front part is also too narrow, with noticeably more spray evading the guard when cranking the bike over, especially running fatter mud tyres. With some extra width, and a more pleasing aesthetic, this could be a top product.